Mackinaw Valley Vineyard and Winery is pleased to announce that it recently received medals from the following International and Regional Wine competitions. The dry red table wine Cole’s Classic won a bronze medal at the New York Finger Lakes International Wine competition as well as a silver medal at the Illinois State Fair Wine competition. Other Mackinaw Valley Vineyard Silver Medal wines at this year’s Illinois State Fair Wine Competition are; Vignoles, Alexander’s Conquest and Eric’s Red. Vignoles is a white dry wine and Alexander’s Conquest and Eric’s Red are semi sweet red table wines. The wine Priscilla’s Passion a dry white wine made from LaCrosse grapes and Mackinaw Reserve a dry red table wine both won bronze medals at the Illinois State Fair Competition. The winery has 20 different wines made from French American hybrids and native grapes. Please ask for samples of these award winning wines when you visit. 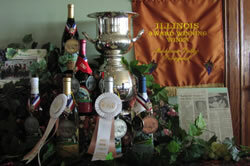 Mackinaw Valley Vineyard’s 2002 Alexander’s Conquest wins “Best of Show” at the 2003 Illinois State Fair Commercial Wine Competition against 25 wineries and more than 250 wines. Silver and Bronze Awards were received by 5 of their other fine wines as well. Paul Hahn awarded 2003 “Winemaker of the Year Award” presented by the IGGVA.